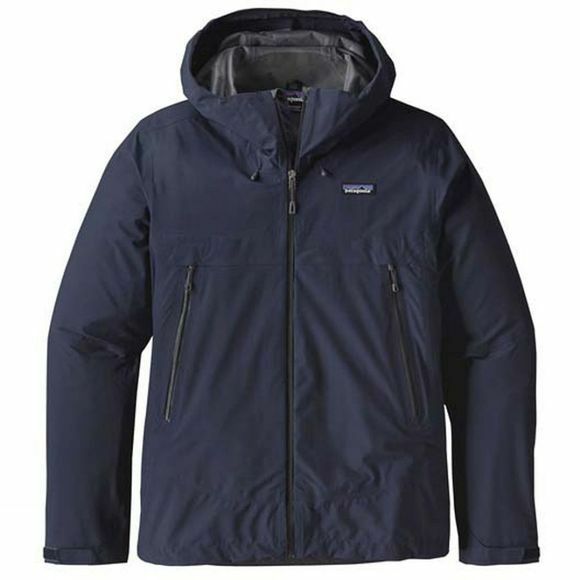 Built with a recycled/recyclable 3-layer polyester fabric, the packable Men's Cloud Ridge Jacket from Patagonia combines H2No Performance Standard waterproof and breathable protection with next-to-skin comfort for wet and sticky conditions. It's also packed with features; the most impressive of which is the stowable alpine helmet compatible hood, which has a two-way adjustment system with a laminated visor to boot. A water-tight full length zip has an internal storm flap to help keep the rain out, while microfleece fabric at the back of the neck and chin provide excellent comfort. 2 watertight, zipped and vented mesh hand pockets are ideal for essentials such as a compass or a snack. The hook and loop cuff closures and adjustable drawcord hem helps keep heat in as you tailor your fit. All of this packs nicely into the lightweight stuffsack with clip-in loop.